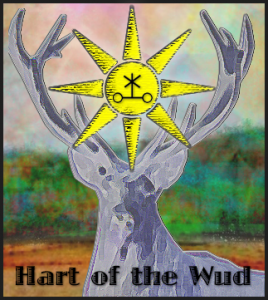 I’ve released three tracks of my composition “Hart of the Wud” for four marimbas and percussion ensemble as a free EP on Bandcamp. I decided to up load a partial album since recording and mixing is a long, slow process. Eventually there will be six movements in total. The pieces are all inspired and take their names from the novel “Riddley Walker” by Russell Hoban, which takes places in a futuristic post-apocalyptic world that has suffered a horrible, civilization destroying calamity. The people who survive live an iron age England with only the dimmest notion of the glories of the past. They stitch together a crude religion based on “Punch and Judy” and the legend of St. Eustace. The entire book is written in a fanciful, phonetic pidgin English. The titles of my pieces all come from that: Connexion Man, Down That Road with Eusa, Sharna Pax, Arga Warga, FoolsCrcl9wys, the 1 Big 1, etc. All tracks were recorded in my basement using a pair of Oktava condenser mics running into a Presonus 1818VSL interface and then into a Mac running Reason 8. Every other sound is played live except for a few samples which I made myself from instruments that I borrowed from friends. It is a painstaking process since I am my own engineer and have to work in small chunks. It is very rewarding when it all comes together. The charts will be available for sale on my site for live performances.